Question: Describe your book, using no more than three adjectives. Go! Answer: Fast-paced, action-packed, entertaining (I hope). LOL! 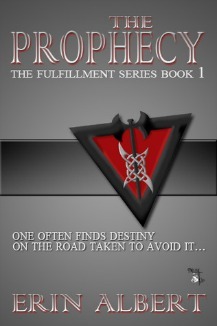 Question: The Prophecy has a gorgeous cover! What is the meaning behind the design? Answer: Thank you!! The lovely Marion Sipe created the cover, but Dream Team member Danielle Craver designed the crests. Danielle is super in to researching the significance of things, so each element on the crest has a meaning. First of all, the color…red is a powerful color, and the Vanguards are powerful people. All of the symbols on the crest point to strength, which is the Vanguard supernatural gift, and combat. The Vanguards are more violent and hot-headed than their Ethereal counterparts. Danielle said the short answer to this question would be: a symbol of strength and combat, especially in women. Question: What drew you to writing about magic and kingdoms and destiny? Answer: I have always been fascinated with the old world feel of kings, queens, and castles. When Game of Thrones came out, I witnessed George R.R. Martin’s masterful combination of fantastical elements with old world charm. I think that, combined with my love of Arthurian legend, sparked the creation of The Prophecy. Question: The Prophecy has Ethereals and Vanguards. Whose side are you on? Answer: I’m not sure I’m on a side per se. But I guess since Layla, my main character, is a Vanguard, I’ll choose them. I love working out and boxing, so I could dig the supernatural strength they possess. I also think their faster paced lifestyle would jive better with my ADD than the more relaxed and laid back Ethereal lifestyle. Question: How do you feel about love triangles? Does The Prophecy have one? Answer: I like love triangles as long as they are done well (read: no whiny female). The Prophecy appears to have a love triangle, but I don’t really think it does. There are mysterious forces at work that affect how characters perceive one another. Question: What scene do you most regret having to cut? On the flip side, what was your favorite scene that got added during edits? Answer: You know what…I don’t think I cut out any whole scenes. My story went through a major rewrite just before I got my contract, so I think I removed all the parts that weren’t beneficial then. And I have to say, I didn’t miss any of those scenes. My favorite re-write in the editing phase was the scene between King Jesper and his wife, Queen Sansolena. I think I only skimmed the surface of their interaction pre-edits, but the whole thing really came to life during work with my content editor, Katie Carroll. Answer: I am currently reading House of Hades by Rick Riordan. Following that, I will be reading Fiery Heart (Bloodlines #4) by Richelle Mead, and Vicious by Victoria Schwab. Question: Which book was your favorite read of 2013 (so far)? Are you looking forward to any new releases in particular between now and 2014? Answer: Hands down, my favorite book of 2013 has been Clockwork Princess. I am looking SO forward to the release of Fiery Heart this year and Forever Song (Blood of Eden #3) in 2014. Answer: The Prophecy is part of a trilogy, and the other two books (tentatively titled The Outlanders and The Fulfillment) are in the revision stage. I also have a YA futuristic thriller, middle-grade coming-of-age, women’s chick lit, and another YA fantasy in the works.